Electrical failure sparks early morning fire on S. Ferdinand Dr. Incident Location: 1456 S. Ferdinand Dr. Narrative: At 5:51 am, firefighters from stations 2, 4, 9, 13, 16 and 17 responded to a reported house fire. The first arriving company found heavy smoke and flames showing from the garage and upper floor of the 1/1/2 story 2,154 square foot residence. Crews mounted an aggressive interior attack on the fire that had spread throughout the attached garage, second floor and attic space of the structure. A working smoke alarm alerted a single-occupant to the fire, allowing them to escape without harm. Additionally, two pet dogs presented a rescue challenge. 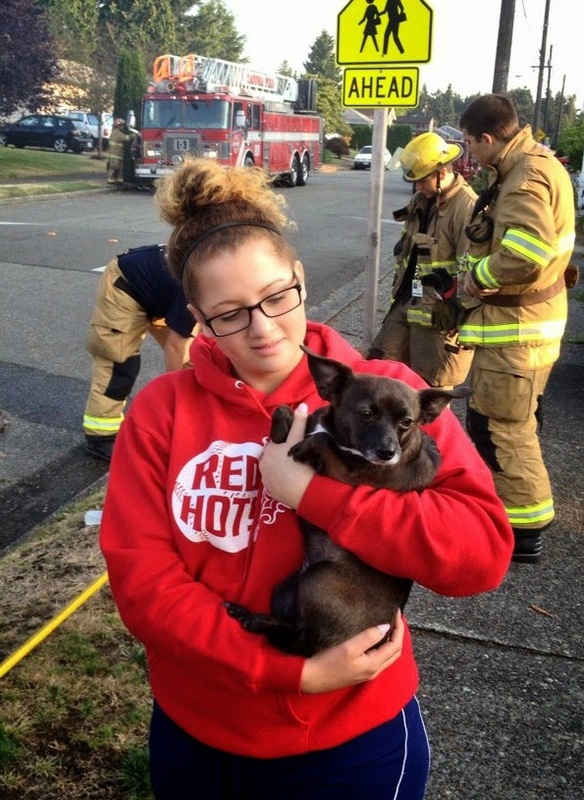 One dog was able to escape initially, but a second chihuahua "Chloe," remained missing for several minutes into the blaze. After an extensive search, she was found hiding under a bed and was brought to safety by the crew from Engine #9. The cause of the fire was failed electrical wiring, resulting in an estimated $155,000 damage to the building and its contents. An additional $3,000 damage occurred to the home next door. The Tacoma Fire Department, Seattle Fire Department and King County Sheriff’s Office conducted a joint training demonstration along the Thea Foss Waterway today. In conjunction with the Marine Security West 2014 Conference in Tacoma, the King County Sheriff Office’s Guardian 2 helicopter demonstrated an Airborne Tactical Extraction Platform (AirTEP) deployment by inserting a Seattle Fire Department rescue swim team into a simulated water rescue scenario.